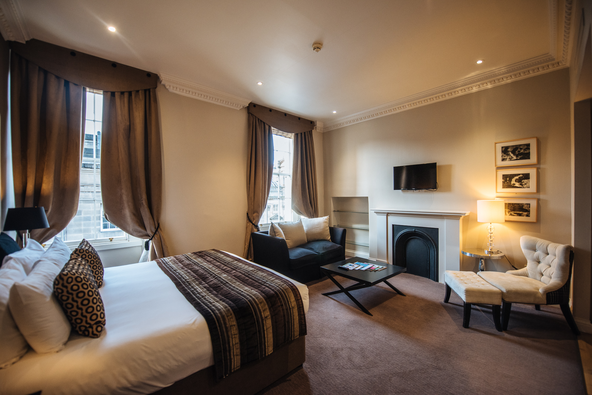 Located within a stone’s throw from Edinburgh Castle and just off the Royal Mile on St Giles Street is the 130-year old building that houses Fraser Suites Edinburgh. The building stands with understated elegance in the heart of Scotland’s capital amongst other hotels in the city, with a sand-stoned Victorian façade restored to preserve its past. Our luxury serviced apartments in Edinburgh's famous Old Town area will make for a very comfortable and relaxing stay in the Scottish capital. The award-winning Gold-Standard Fraser Suites Edinburgh offers 75 units of fully furnished luxury serviced residences designed with contemporary interiors, adorned with sophisticated touches and furnished with the necessary modern conveniences, ideal for business and leisure stays, with the exclusivity of a boutique hotel Edinburgh travellers have come to expect.